Professor Ute Hellmich of Johannes Gutenberg University Mainz (JGU) has received a Fulbright-Cottrell Award, the most important transatlantic prize recognizing excellence in research and teaching. It is awarded by the German-American Fulbright Commission. This year's two recipients—Professor Steffen Schumann of Georg-August-Universität Göttingen has been honored alongside Hellmich—will each receive EUR 63,000 from the German Federal Ministry of Education and Research (BMBF) for a three-year teaching and research project and be given the opportunity to participate in the annual Cottrell Scholars Conferences in the USA. The official award presentation took place during a ceremony organized by the Fulbright Commission in Berlin. The award recognizes the combined research and teaching achievements of young German researchers who undertake teaching assignments in connection with Bachelor degree programs in the fields of chemistry, physics, astronomy, and biochemistry. The corresponding Cottrell Scholar Award has been presented annually in the USA since 1994. "The public image of a researcher is decisively influenced by his or her achievements in the field of research although a major part of our everyday work actually involves teaching and supervising students and doctoral candidates," emphasized Hellmich. "The Fulbright-Cottrell Award is unique as it recognizes not only accomplishments in research but also explicitly teaching achievements and thus I feel deeply honored by this award." It was Hellmich's proposed project "From local alterations to global changes: ABC transporters to study molecular determinants of protein function and dynamics" that convinced the jury. The project focuses on the molecular dynamics of membrane proteins and how the tiny machines in the membrane of our body cells control the uptake or release of substances such as nutrients and toxins. "Membrane proteins need to move in a very controlled manner to achieve the correct directional movement; it is as if they were a sluice that can only be opened on one side at a particular time," explained Hellmich. "We want to understand how these machines work and, using these machines as an example, reveal to our students how wonderful biochemistry can be and how satisfying a field of study it is." Ute Hellmich, born in 1981 in Heidelberg, studied Biochemistry at Goethe University Frankfurt and subsequently earned her doctorate with a thesis on the interaction between membrane proteins and lipids. She also spent periods abroad at the University of Cambridge and Harvard University. Hellmich was appointed Junior Professor of Membrane Biochemistry at Johannes Gutenberg University Mainz in January 2015. Her professorship is sponsored by the Carl Zeiss Foundation. The biochemist is also a Guest Scientist at the Center for Biomolecular Magnetic Resonance (BMRZ) at Goethe University Frankfurt. Her team currently investigates the functional dynamics of multi-substance transporters and ion channels in parasites. 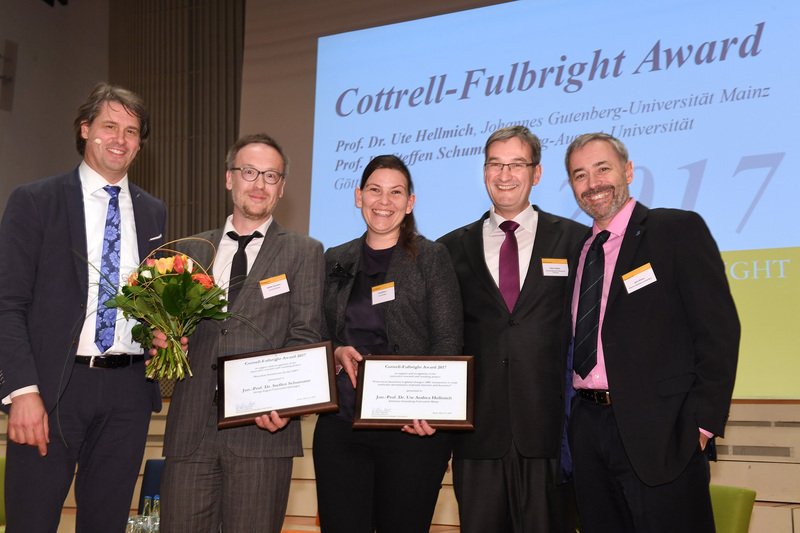 Professor Ute Hellmich at the Fulbright-Cottrell Award presentation ceremony in Berlin; also present from JGU was Humboldt Professor and 2006 Cottrell Scholar Jairo Sinova (r.).